Feature: Compressed to a wafer and expands To 3/8"x 2.75". Easy to store and provides smooth application of most varied products. Non abrasive and yet mildly exfoliating with many products. Our sponges are comfortable for both aesthetician and client. Usage: Very smooth applications and will not drag on or irritate skin with proper maintenance. Used in skin care clinics and spas as cleansing sponges, toner application sponges, and in many other procedures at home as well. Available for promotional product message advantages. Our sponges can be used at Home or in your favorite spa for young and mature activities. 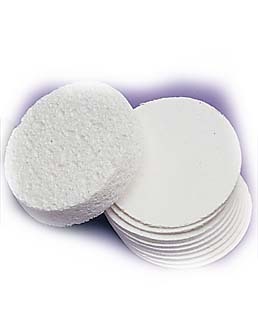 Our sponges are used in medical facilities from MD dermatology practices to medical school forums. Join the cue for quality. Buy Teka/Danielle products. Sold as seconds with defects.